The Ultimate Guide to Playing Chess for Beginners! Chess is played on a square board that is divided into 64 squares. Regardless of the color of the squares, the lighter shade or colors are referred to as ‘white’ while the darker color or shade is referred to as ‘black’. The game has evolved much through the ages, and has come a long way from what it was in the 6th century. The modern rules of the game first took form during the 13th century, which gave more freedom to the pieces in terms of mobility, such as the queen and bishop. Chess is not only a complex game that requires intelligence, cunning and wit, but it is also a highly enjoyable pastime. No wonder, it is the most famous board game in the world, with more books written and research done on it than any other board game. This is going to be a basic guide to playing chess. Rooks are placed at the corners of each side. Knights are placed beside the rooks. Bishops are placed beside the knights. The queen is placed on the central square of the same colour of the player. For example, white queen will go on the white square, while the black queen will go on the black square. The king takes the spot beside the queen. The pawns are placed in front of the pieces. There are 64 squares on a chess board that’s divided equally between black and white squares. Each square can only occupy a single piece at a time. Chess is played between two players who move the pieces taking alternate turns. Traditionally, the player with the white pieces starts off the game. The objective of the game is to trap the opponent’s king. The attempts of either player to trap the opponent’s king is called a check, while a checkmate is when the player who has their king checked is unable to save their king. A checkmate happens when the king being checked is unable to make a move without being captured by the opponent. Both players attempt to put their opponent’s king under attack during the whole duration of the game until they have a checkmate. The player who reaches a checkmate is the winner of the game. 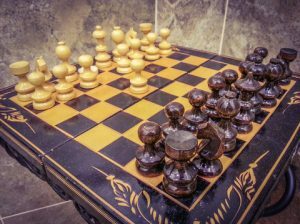 Keeping a record of the various moves is helpful in improving your standard of chess. Each square on the chessboard can be identified with a unique name that comprises of a letter and a number. The vertical files are labelled in small letters and goes from white’s left to white’s right, while the horizontal ranks are simply numbered from 1 to 8. In this way, each square on the chessboard is identified by a letter and number. The vertical rows are known as files while the horizontal rows are called ranks. Every piece in chess has its own unique movement. This means each piece has to follow certain rules that are specific to its type. This is the reason why it is important for players to know the value of each piece in their arsenal. While the points do not give the player an absolute evaluation, it does help when it comes to choosing when a trade is worth it and what trades to avoid. Let us take a look at the points of different pieces in chess. The King has not been included in the above points chart mainly because it is of infinite value, considering whoever manages to checkmate the opponent’s king wins the game. The King – The king is able to move only one square either forward, backward or diagonally. The Rook – The rook moves forwards or backwards through any of the squares that are unoccupied. The Bishop – A bishop can move any number of squares in a diagonal direction. The Queen – The queen can move in any direction. The Knight – The knight is able to move two squares horizontally and one square vertically, or it can move one square horizontally and two squares vertically in an “L” pattern. The knight is not blocked by other pieces while jumping to a new position. The Pawn – A pawn can move forwards a single square if the square is vacant. If the pawn has not already made its first move, it can move two squares forward, that is, both the squares are vacant. A pawn is not allowed to move backwards or diagonally. A piece cannot move over any other piece in their way to get to a vacant square, unless it is a knight. The word ‘check’ basically means that you’re king is in danger and must be saved. Check is a condition in the game of chess where a player’s king is under threat of being captured by the opponent. In this situation, the player whose king is in check has to remove and protect their king from that square immediately. There are also various types of checks. The following are some of the ways in which players can check their opponent. When a piece is moved out of a line of attack exposing the opponent’s king to another piece such as a rook, bishop or queen that checks the king it is called a discovered check. The piece that was moved initially can be any type of piece that belongs to the same player as the checking piece. A discovered piece is also used as a tactic to divert the attention of the player whose king is being checked, and can be moved to attack another piece of player after they have moved their king to safety. This is an effective move since the person whose king is being checked is unable to thwart the attempt of the opponent as they have no choice but to move the king to safety, thereby sacrificing another piece. This move is a check from not one but two pieces of the opponent in a single move. This occurs whenever a moved piece attacks a king, resulting in a second piece checking with the discovered check. A double check is also possible when an en passant capture opens up two lines of attack at the same time. The reason why a double check is so effective is because it cannot be blocked, nor can the player capture two pieces of the opponent in one single move. Whenever a check has been answered by a check and especially if the second check is carried out with a piece that’s blocking the first the move is known as a cross check. While a cross check is very rare, they do happen, and are a common occurrence that’s considered as a chess problem. Once a player’s king is in check they need to protect the king from that square. We shall explore the ways in which a player is able to protect their king in this position. The first move of the player whose king has been checked by the opponent is to find a way to capture that piece. The move of capturing the piece that is involved in the check is legal if it is not protected by another piece of the opponent. The easiest thing to do is to simply move the king away from the square it is currently placed in, that is, if it keeps the king from getting checked. One thing to remember is that certain pieces like the bishop or knight can move multiple squares. So, it is important for the player whose king is in check to make sure that their move does not place the king in any of the squares that come in the path of the piece involved in the check. There will be times when moving the king from the square that has been checked places the king in another square which is also in check by another piece of the opponent. In this case, the player cannot move their king on that square, or any of the squares that can get the already checked king captured. Another move is to attempt to block the piece that is giving check without having to move the king. This can be done by placing any other piece in the path of the opponent’s piece that is giving check. However, the player whose king is being checked should make sure that by moving another piece they are not exposing the king to another of the opponents pieces that could checkmate the king again. What happens when a player isn’t able to save their king from a check position? Well, if you do not find any legal move that can protect your king from the check position, it is considered as a ‘checkmate’ and the player whose king has been checkmated loses the game. A checkmate usually happens in the situation of a ‘double check’ where the king is being checked no matter which square it is moved to. Also, a checkmate can be delivered by any piece of the opponent except for their king. Checkmates are rare among advanced players because many players resign respectfully before forcing their opponent to a checkmate. But, with beginner and intermediate level players, a checkmate is the only way a game ends. Part of that is due to the many mistakes that are made by beginners which results in a checkmate. However, a checkmate can also take place with all the pieces still on the board, in what is called a ‘Fool’s Mate’ where the player makes a mistake of exposing their king early on during the game. Both players do not have the players to checkmate their opponent. The players can declare a draw if they reach the same conclusion at least three times during a single game. It is a player’s turn to move, but he does not have any legal moves left, although their king is not in check. The player can also declare a draw if a total of 50 chess moves have been played by both players and not a piece has been captured. Both players agree on a draw. It is common knowledge that a chess pawn can move only forwards and not backwards. They can also capture other pawns sideways. But, what happens when the pawn of either player reaches the last square on the opposite side of the board? Whenever a pawn is able to reach the last square of the opponent’s side it can be promoted to a queen, bishop, knight or rook. The promotion of the pawn is usually possible in the latter part of the game when the board is fairly empty, and can have a significant impact on the outcome. Playing the game of chess also includes special moves that can either help defend the king or plan an attack on the opponent. There are two special moves that are widely used in chess. Castling is a special move where the player moves their king and a rook simultaneously. The move is executed by first moving the king two squares towards the rook, then moving the rook to the square on the other side of the king. How many squares does the king and rook move while castling? There are basically two types of castling; the short way, which is on the king’s side, and the long way which is on the queen’s side. In both these cases the king has to move two squares while the rook has to move either two or three squares. For the move to be legal, both the king and rook should not have been moved previously. An en passant capture is the capture of the pawn which occurs immediately after the pawn moves two ranks forward from its starting position and the pawn could have been captured by the enemy if it had moved a single square forward. The en passant capture move was first introduced back in 1490 when pawns were granted the ability to move two squares forward on the first move. The move was introduced to limit the freedom and power of a pawn. The all important opening is where you will either make or break your game play for the entirety of the game, that is, unless your opponent does not make a stupid mistake. In the Opening the player should – First things first. You have to develop your pieces. Protect the King – The whole point of playing chess is to protect the king. The opening is where you will need to use a tactic known as “castling”. Never focus on a single piece – Remember that this is the time where you need to develop ALL of your pieces, so don’t focus too much on a single piece. When one starts a game of chess there is no way of exactly knowing which way the game will go. One wrong move could end up in you losing a valuable piece. This is why during the middle of the game your priorities will change. This is the time to have a plan for moving forward. Look for the optimal square for each piece – Are the squares your pieces are on strong or would you like to exchange them. This is the first question to ask yourself. Know what you want – During this time, it is extremely important for the player to know what they want to do with their pieces. Keep your King protected – No matter what point you are in the game, the player’s ultimate goal will be to protect the king, and keep it from a checkmate. Try to figure out what your opponent wants – Remember that your opponent has a plan too, so try to figure out what that plan is so there are no surprises. Activate their king – This may seem counter intuitive, but the king is a very powerful piece in the endgame. The king is usually the last piece to be involved in a defend or attack strategy. Protect and promote the pawns – In the endgame, it is easier to promote pawns because both players have less pieces. That being said, pawns are the most valuable and vulnerable during the endgame. But, if played well, the pawn can easily be converted into a queen or some other important piece that can help you turn the tables on your opponent and win the game.